Most disciplined cadet Alosio Petero during the Latter-Day Saints college passout parade on August 1, 2017.Photo:Vilimoni Vaganalau. 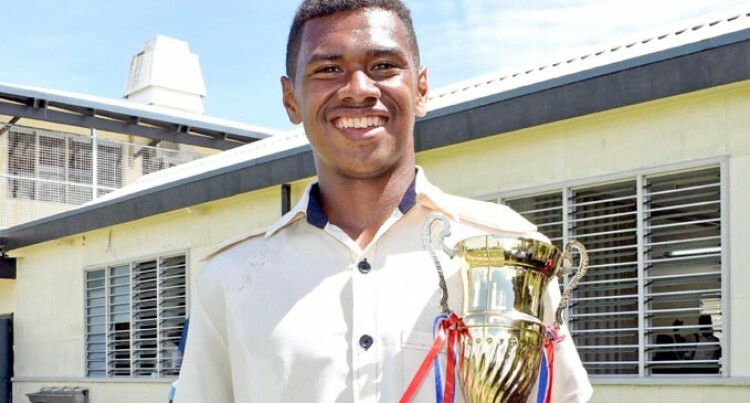 Alosio Petero Sanele was named the most disciplined cadet during the Latter-day Saints College pass-out parade on Friday. He dedicated his success to his parents and the parade commander. The parade was held at the school in Tamavua, Suva, with 303 students, commanded by the Fiji Police Force. Alosio, 17, originally of Vuna, Tailevu, is the eldest of the four siblings. He was surprised to hear his name announced as he won the most disciplined award. He wished his parents were there to witness the ceremony. “I did not see my parents in the crowd today but I am sure if they were here, they would have been really proud of me for achieving this award which means a lot to me and my family,” Alosio said. “I am the eldest in my family and I believe this award indicates high discipline and motivation for me to ensure my siblings are well disciplined and motivated as well,” he said. “I dedicate my award to my parents and the parade commander.